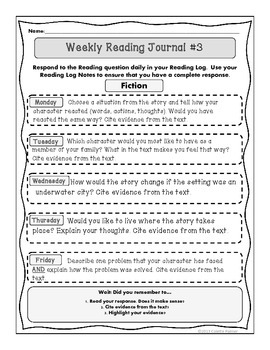 Are you needing Weekly Reading Journal Prompts that align with the CCSS for Literature and Informational Text? Well then look no further! 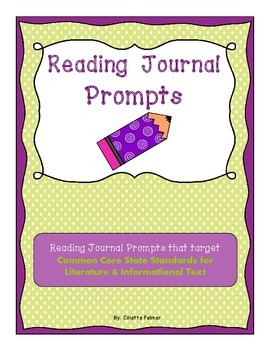 This product includes 6 weeks worth of daily journal prompts for Fiction and Nonfiction texts. 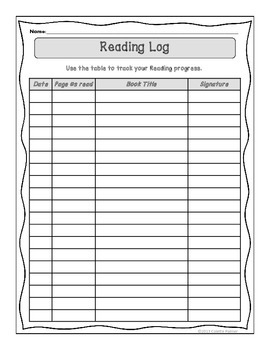 I created this product for my own 4th grade students who needed additional support / guidance in writing a response in their Reading Journals. They seemed to struggle with "self-selected" topics, so voila!....Weekly Reading Journal Prompts. The prompts were written as a review for the skill that I taught the previous week during Reading. 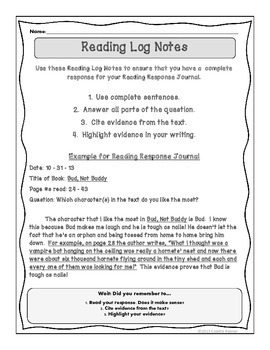 Not only do the Reading Journal Prompts review Reading skills, but they also align perfectly with the Common Core State Standards for Literature and Informational Text. Also, they address the Writing Standards as well with a HUGE emphasis on using the text to cite evidence. The students are required to highlight the evidence in their writing as well. **Fiction Skills included: Story Elements (character, setting, plot), Problem/Solution, Character Analysis (words, actions, thoughts), Character Traits, Compare / Contrast Characters, Compare / Contrast Setting, Theme (with a connection to characters' actions), Title (also relating it to the plot), Summarizing Strategies, Making Connections (self, text, world), and Higher Order Questioning. **NonFiction Skills included: Vocabulary, Author's Purpose, Summarizing Strategies, Higher Order Questioning, Text Features, Fact / Opinion, Main Idea & Details, Background Knowledge, and Picture Analysis. I have included a 4-page preview (full pages!) so that you can see the quality of work in this product. Please ask any and all questions before you purchase. I am always looking for ways to improve my products, so if you like what you see…leave some feedback or comments! I love hearing from you all!